It may seem like there's not a lot you can do, besides studying, to improve your mental state on the day of the SAT. But there are a few key things that can make a huge difference, and one of them is where you take the test. Why does what SAT test center you choose matter so much? Well, your brain can only focus on math, reading, and writing when everything else is out of the way, and a lot of things that can get in the way have to do with logistics and environment. 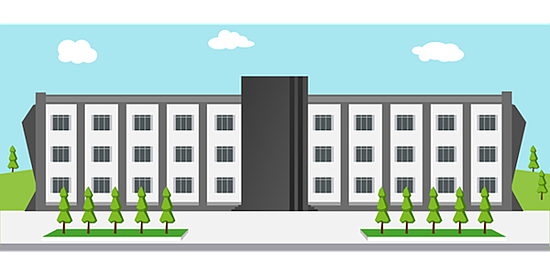 In this article, we'll discuss the two ways of finding convenient locations for taking the SAT. Where Can I Find the SAT Testing Centers? There are two ways to find SAT test centers. The first is more convenient but more limited, and the second is inconvenient but gives you clearer information. I recommend that you choose only the state and don't type in a city. (When you type a city, the site finds SAT test locations in only that city and doesn't include locations in nearby towns). Instead, choose the state, then browse for cities that are close to you. 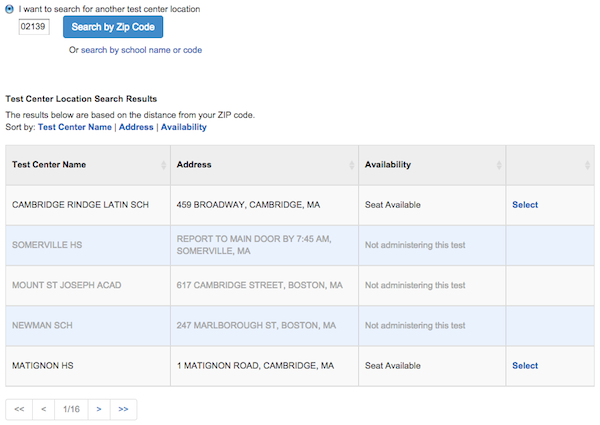 This screen shows the first two SAT centers in Massachusetts that begin with “A” for the October 2017 SAT test date. 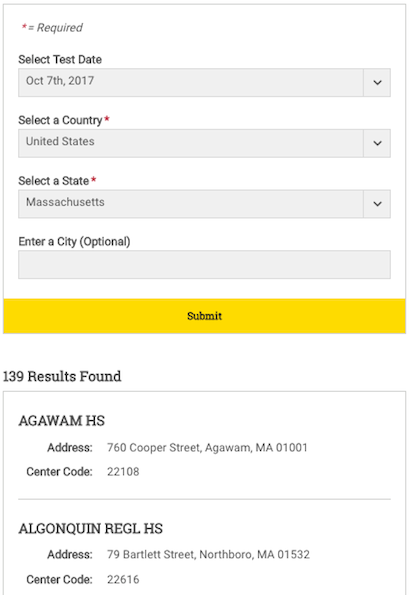 The drawbacks to this search method is that you can't search for test centers close to you but in different cities. Furthermore, this doesn't tell you whether these test locations will administer the test on the date that you're planning to take the test, or whether all seats have been taken. The next method solves both these problems. To find test centers closest to you by zip code, you have to start to register for the test. You don't actually have to complete registration. This method is more cumbersome but also more informative. First, visit this page, and then click "Register for the SAT." 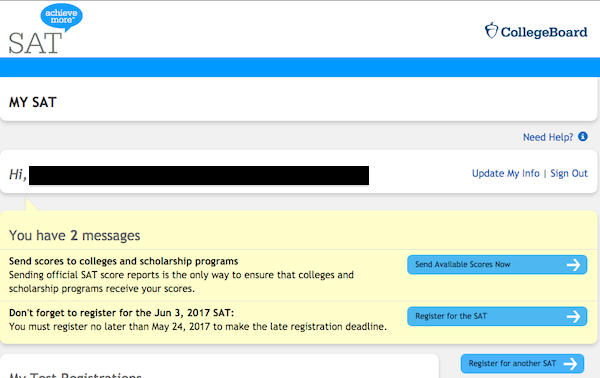 After logging in, you'll be taken to your "My SAT" page, which has a blue button labeled "Register for the SAT" on the righthand side. Once you click that button, you'll be taken to a test registration screen. You'll first have to fill out a page with your personal information (including what test date you want). You'll then be able to skip through a number of forms asking for information about your high school experience (no need to put that in now). Finally, you'll end up at section 3, "Select Test & Center"
This screen gives you a lot more information. First, I can see that SAT testing locations that normally administer the test don't happen to be administering this specific test. If one of these were my high school, I would suddenly have to change my plans. Secondly, there are only a limited number of seats at each location. If you register too late, you can run out. You can see that this method of search is more helpful. Why doesn't the College Board make this more informative option available publicly? Sometimes you have to wonder whether the College Board just likes making things more difficult for families. Which SAT Test Location Should I Choose? How far is it, and how long does it take to travel? How familiar are you with the location and layout? Will you know other people at that location? Will that improve or worsen your performance? Are there known problems about the test center that make it problematic? We'll cover each in order. #1: How Far Is It? How Long Does It Take to Get There? The number one issue regarding test location is timing. You want to get there on time--the College Board recommends arriving at the test center no later than 7:45 a.m., unless the Admission Ticket says otherwise. This typically means you'll need to wake up early, maybe earlier than you're used to. For example, if it takes you an hour to drive to the test location, you’ll likely need to wake up around 6AM to have enough time to get energized, eat breakfast, and arrive at the site with time to spare. Keep in mind that the longer it takes to get there, the longer the delay might be. A 10 minute drive might be delayed only by 5 minutes, but a 60 minute drive can be delayed by 30 minutes. Recommendation: Generally try to choose locations that are closer to where you live. #2: How Familiar Are You With the Location and Layout? On the day of the test, you want as little stress as possible so you can fully concentrate on the test. If you've traveled to the location before, then chances are much lower that you'll get confused by directions or run into unexpected construction. On the other hand, traveling to an unfamiliar location might cause you to be stressed, which might not wear off until well into the test. Similarly, knowing the layout of the location is helpful during bathroom breaks. Because you only get a few minutes to use the bathroom and eat a snack, getting lost in the hallways can be anxiety-provoking. Because test centers often don't provide clear signs to the bathroom and back to the classroom, it's possible to lose your way. Recommendation: Choose a location that you’re familiar with, both in travel and layout. 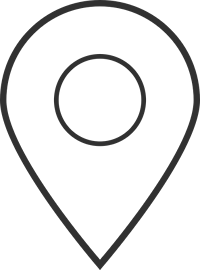 If you must choose an unfamiliar location, visit it to get familiar with it, or budget extra time the day of the test to get there earlier and learn the layout. #3: Will You Know Other People at That Location? If you choose your local high school like most students, you’ll likely run into a lot of people you know. Depending on what type of person you are, this can be a good or bad thing. To some, being around friends is helpful. It relieves stress, and chatting during breaks helps them feel less nervous about the importance of the test. To these people, going to an unfamiliar location with strangers actually causes more anxiety and puts them on edge. To others, the opposite is true - being around friends for the SAT is more stressful than being around strangers. You might want as little distraction as possible, and talking to your friends might make you lose concentration You want to relax silently during breaks, but you don’t want to give the impression that you’re rudely brushing off your friends. Plus, what if you take the test in the same room as your crush? It might be hard to take the test with the person close by. Which group do you fit into? Each person is different, so decide accordingly. Recommendation: If being around friends on test day is helpful, register at your high school. If it’s stressful, register elsewhere, keeping in mind the location and layout factors above. 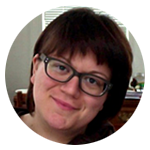 #4: Are You Aware of Issues With the Test Center? Temperature control: do you know if the location can maintain a temperature that’s comfortable for you? Or are the thermostats always malfunctioning? Windows: do you tend to feel claustrophobic in this location, and might the presence of windows help you relax? Testing environment: do you know if the location has noises, smells, or other factors that might be distracting? Maybe the desks tend to be uneven, or the chairs uncomfortable? Recommendation: Avoid testing centers with known problems. For most students, they'll take the SAT at their high school, if possible. But this isn't always the best option. Should I Take the SAT At My High School? Seeing people you know causes you more stress or makes you break concentration. There's another location that's significantly closer to your home. If you can save 10 minutes or more of travel time, this can be worth it. You already know of problems at your high school, like a nearby construction project. Being in the same environment as where you spend most of your day causes you to lose focus or doze off. I feel strongly about this topic because it made a huge difference for me. When I took my second SAT, all the slots at my high school were full, so I chose a high school about 30 minutes away. The drive was relaxing, and it felt totally neutral, a buffer between the SAT and the rest of my life. My test location didn't feel like school; it was a big concrete building and nothing was familiar, so my mind was a blank slate. The previous year, I'd scored a 1440 (of 1600) on the SAT I took at my own high school. I didn't do any prep between the two SATs I took, but on the test I took half an hour away, I got a perfect score. Read all your mail and email in the weeks leading up to the test. If your test center is canceled for your test date, this is how you will be notified and given an alternative. Your test center might be canceled for a number of reasons. 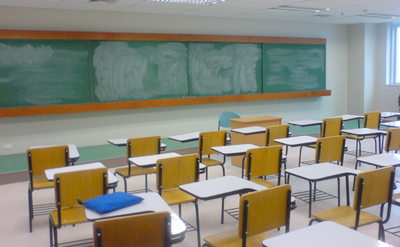 One possible cancellation happens when too few students sign up to test there. If that, or anything else they control, changes, you will be notified and given an alternative. They also cancel locations where weather makes it dangerous for students to travel. In these cases, the cancellation will be announced on Friday night and Saturday morning on this website. If you're registering in an unfamiliar location, consider visiting it days before the test. This will make sure you've traveled the route once before. You can also check out the facilities and environment so you have an idea of what to expect. If your SAT test center is close by, then great! You'll be able to take more time to sleep and won't have as much time to stress on your way there. Pack a breakfast to eat on the way there. This can save you some time so you don't have to wake up extra early. Because the ride is long, you have more opportunities to feel anxious. Pack along music that relaxes you and makes you feel confident. Try to review notes on your way there. This will keep your mind tuned, especially since you have to wake up earlier than normal. You can change your testing location after registration, but it'll cost you $28, and by that point seats at other locations might be limited. 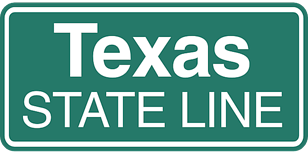 If you live near a state line, you may want to consider which state you'd prefer to take your test in, because their laws differ. Some states mandate reporting scores to scholarship agencies, for example, and California and New York have special rules about the information test-takers must be given. If you want to take the SAT in a different state, make sure you know their regulations! Now that you know where to take the test, find out WHEN the best SAT test dates are. What's a good SAT score? Read our step by step guide to figure out what score you should aim for.